The Great Western is the pub nearest to the cottage, and its food and service has proven very popular with visitors. The people who run it are friendly and hard-working and do everything to ensure that the pub is a real asset to the community. You can see it from the cottage, but to get to it you need to walk up to the corner, about 200 yards. A little further on, you come to the church, a typical Cotswold stone tower. Occasionally, concerts are held here. You might have noticed it in the background of the previous picture. It is right at the centre of the village, just below the village green. 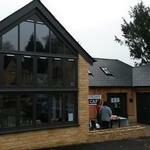 Blockley's community run shop and cafe has had a major upgrade to new purpose-designed premises in mid-November 2014. The shop is now much extended, both in terms of the range of goods sold and the opening hours. It now sells a goof range of ready-to-cook meals, for example. It is now open from at least 8am to 6pm but Sunday, when it has the normal six hours. The cafe serves coffee, tea, drinks, etc, and does meals on Friday evenings. These new premises are much easier to work and illustrate the pioneering spirit of the community. This is the large, sloping village green. You can see the war memorial and behind it a very attractive row of houses overlooking the green. From the green you have some fine vistas of the surrounding hills. To the right and behind is the bowling green. Behind the camera is the village shop and post office. This is Blockley's other pub, which as it is a hotel also has a separate restaurant. It is a very attractive building. This is taken from a footpath above the village, to the East. Looking down, you can see that the village is laid out along the course of Blockley Brook. It is the brook which, despite being just a gentle stream, powered all the mills that once provided employment to several hundred workers. Silk was the main product of the mills.